Sales Quotes and Purchase Orders are vital documents for keeping control of your business commitments. As part of our strategy to provide the best value online business software, we are delighted to announce the integration of these features into the existing AccountsPortal application. 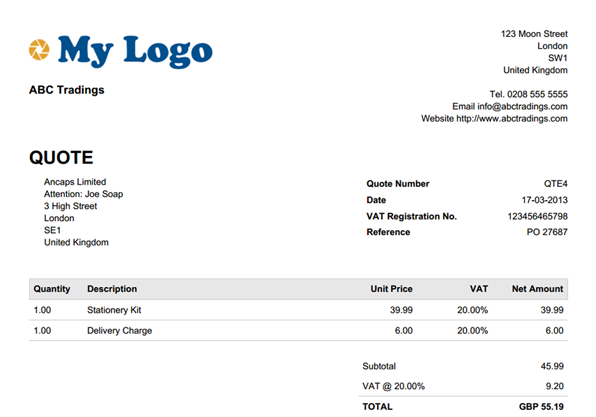 Sales Quotes and Purchase Orders are created in the same way as Invoices. You can then easily convert them to an Invoice at any time, and we also keep a record of when the conversion took place. Similarly, you can also mark Quotes and Orders as Rejected. There are no extra settings required but we recommend you read through the Sales Quotes and Purchase Orders documentation to familiarise yourself with the functionality. The resulting PDF documents can be printed or emailed and make full use of the Branding and Templates functionality for styling requirements.